SUMMARY: Four Prince Charmings (from Snow White, Cinderella, Sleeping Beauty, and Rapunzel) join forces to battle the witch Zaubera and save Cinderella and five kidnapped bards from her evil plans to become infamous. 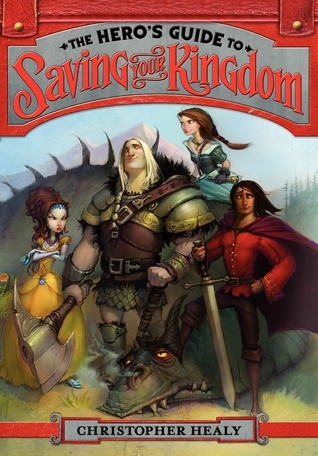 REVIEW: Funny and immensely creative, The Hero's Guide to Saving Your Kingdom will be a hit with middle grade fairy tale fans. The "heroes" of the story--Princes Frederic, Gustav, Liam, and Duncan--are each well-drawn and distinctive from each other. Each has his own personality and brings his own strengths and flaws to the adventure. My favorite would have to be Duncan, whose quirky and easy-going personality really kept me in stitches! I also love how Ella ("Cinderella") becomes a hero herself, and Princess Briar Rose ("Sleeping Beauty") is a mean, spoiled brat. It will be interesting to see how a certain love triangle plays out in the sequel. Will our four heroes end up with their original princesses? If I had any complaints, it would be with the length. I got a little bored in the middle. The story is so focused on character development that sometimes the action falls to the wayside. That's not to say there isn't enough action (there is tons of action! ), but for whatever reason, I got bored and found myself skimming in parts. THE BOTTOM LINE: Middle grade readers will LOVE this book. I recommend it wholeheartedly for librarians and parents looking for a clean adventure story for their tweens. I can see this being a Pixar movie--I'd definitely go see it! STATUS IN MY LIBRARY: On-order. I ordered The Hero's Guide to Storming the Castle as well. Sexuality: very mild; references to "true love's first kiss"
Oh! I still have this one on my reading list! This cover is great, I love the art style. It sounds fun might have to get for my kids.